So with Portland and Montreal as our two choices for expansion, now it’s time to decide which one goes in the American League and which one goes in the National League, and then set up our four divisions per league. 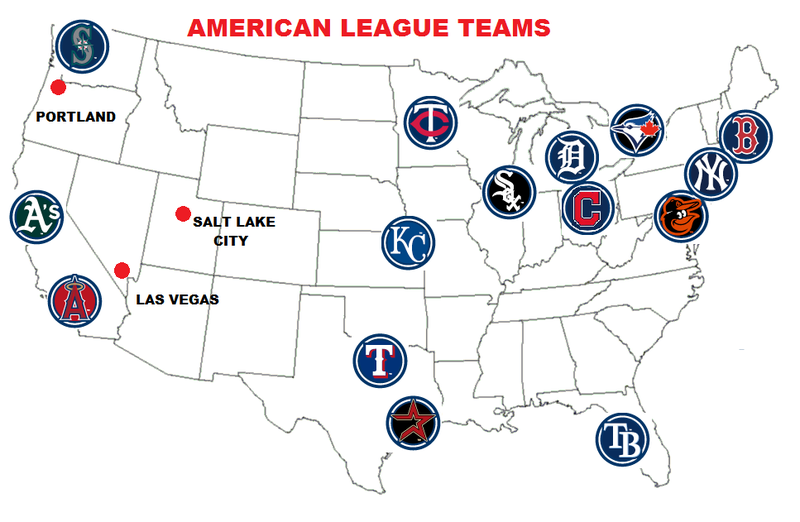 And work on scheduling…..
A look at the map of American League teams makes it bloody obvious that Portland must be in the AL. 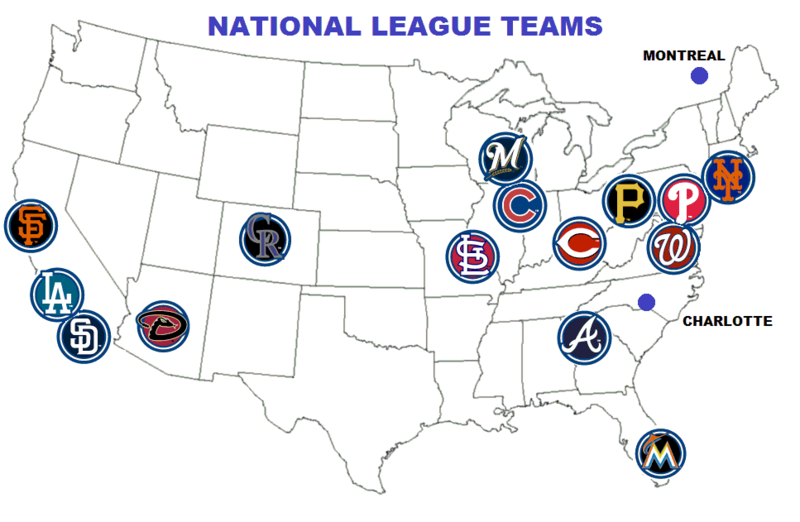 That league has only three teams west of Kansas City; the NL has five. Given the travel times involved, and the fact that the Pacific coast and Kansas City are two hours apart according to the time zones, Portland must belong to the AL. Players are already complaining about crappy travel situations (traveling after a night game to a different city for a day game the next day); imagine adding two hours of jet lag to that. If you don’t make Portland (or Vancouver, or Salt Lake City, or Las Vegas) an AL West team, then you have to put Kansas City in that division – which would be the only one in baseball that spans three time zones. There’s only one other thing to decide when setting up the other divisions. There are three teams (Texas, Houston, Tampa Bay) that would obviously belong to the Southern Division. Is the fourth team Baltimore or Kansas City? The former may actually be south of the Mason-Dixon Line, but I don’t think that Baltimore really considers itself “southern”. Let’s put Kansas City there, due to geographic proximity to the Texas Rangers. For the National League, things are easy. Once you see that all four teams in California and Arizona make their own Western Division, the rest fall into place. Now, what about scheduling? There’s a bit of a push these days towards “balancing” the schedule – making sure each team plays the same opponents the same number of times so no team gets an advantage by playing weaker teams more often. We also want to keep the 162-game calendar (or at least avoid adding games), and have an equal number of home and away games for the teams. Each team in Division A has three intra-division opponents, and twelve inter-division opponents. Given that we want more games against teams in the same division (intra-division), and that the three-game series seems logistically optimal, what would a balanced schedule look like? At the very least, you’ll have six games (3 home, 3 away) with each of the twelve inter-divisional teams. That makes 72 games total, leaving 90 games for intra-divisional action. Thirty games (15 home, 15 away) against each team in you division might be a bit much. If you go with eight inter-divisional games (4 and 4, for 96 total), you’re left with 66 intra-divisional games which works out to 22 per team (11 home, 11 away). Eleven games doesn’t quite work out to nice series numbers (3+3+3+2 or 3+4+4), but it is manageable. What about interleague play? It’s still possible, but you don’t want to overdo it. Again, each team should have the same number of interleague games, and they should also be balanced among the same teams (if at all possible) and the same number of home and away games. In Year 5, repeat the Year 1 pairings and continue the cycle. Note that each year, a given team plays half of all the teams in the other league, and the next year, the other half. You’ll want each series to last three games, so with eight teams to face, that’s a total of 24 games. There aren’t enough inter-divisional games; so we’ll have to take these from intra-divisional ones. Both give a total of 162 games per season, an equal number of home and away games, and each team in a division faces the same opponents the same number of times. The 14 intra-divisional games (7 home, 7 away) in the second plan work out to series of 3, 2, and 2 games or 3 and 4 games. The latter is probably preferable, but the first plan is probably more preferable still.